Even though it has been sunny at times, most of my plants only need watering once a week, so I have increased feed to full strength No 3. Below is a photo of a plant that had quite a lot of the old root ball removed as described in the October section. This was done three weeks ago. As you can see the roots have romped away in the fresh compost and found their way to the bottom of the pot already. This does show that this method really works. By doing this one does get a few yellow leaves. I go through every plant and remove them, checking for any pests at the same time. It was a mild November here so I delayed putting the bubble wrap insulation in the greenhouses until this month. All the sides have been done, as always I leave all the roof area until the frosts come. This means that the plants will benefit from the extra light, and doing the sides gives them added protection from the cold easterly winds on the Suffolk coast. The roof area was insulated on the 12th as the temperature has taken a big dive, with the first frost on the 16th. 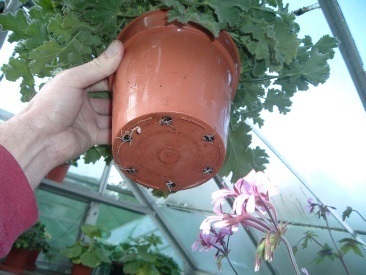 I started to treat plants with Provado to protect them from pests during the winter months. I mix it in with the feed and as I water from the bottom do it twice in succession to make sure they get enough. I make use of this time over the Xmas period to sort out what plants are needed for shows, and work out stopping dates. What a cold start to the New Year, this will no doubt slow down the growth of the plants. With the daytime temperatures below freezing as well as the nights, it is becoming a struggle to keep the temperature around 5-6 degs. C. Quite a few plants have yellow leaves which need sorting, and some of my younger plants need stopping. I keep hoping it will warm up so I can sort them out - LOL. When potting on this time of year, I put the compost mix which is in a big container indoors to warm up before using. I do this for the plants benefit, not mine. This had to be the coldest start to this month for ages, with freezing temperatures and more snow. All one can do is keep plants frost free and hope things improve soon. I moved the Angels to the warmest parts of the greenhouses, as I have lost two nice plants which were against the glass. Never have I seen so many yellow leaves as this year, (Has anyone else had this problem?) When removing them I also take off any big leaves from Miniatures and Dwarfs, as they are not in keeping with the size of the plant. Where does the time go, week 7 which is 18 weeks to the National Show. I have found that the older the plant the longer it takes for them to come into flower. So this week I made final stops on a few Regals, will do a few more next week. Getting Regals to flower at the right time is not that easy as a lot depends on the weather.